It seems like I was just here, lamenting a heart-rending loss by Virginia’s basketball team in the regional final of the NCAA tournament. A step from the Final Four, about 10 minutes of game time away, actually, the Cavaliers, known for closing big leads under coach Tony Bennett, for once could not make a big halftime edge stand up. 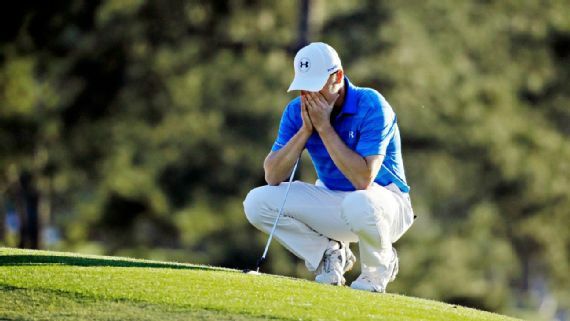 Jordan Spieth knows the feeling, on top of the surreal shock that tore into his chest Sunday in the final round of the Masters. With nine holes to play, Spieth led the Masters, dominant in his defense of his 2015 championship, by five strokes. Like a machine, he had just made four birdies in a row. Standing on the 10th tee, Spieth appeared unapproachable, his lead insurmountable. A half-hour later — more specifically, a bogey-bogey-quadruple bogey later — Spieth was behind England’s Danny Willett, destined to rally but never to catch up. Cracks had appeared lately in Spieth’s veneer, but he had been great at patching them on the fly. He is unflinchingly honest, and he even spoke recently of coming to the practice range before a tournament’s final round unable to control the slice emanating from his swing. What? How can a top-five player suffer that kind of hacker confusion? Who knows? All we know is it seemed as though Spieth was over his swing vexation, and then he wasn’t. It went so bad at No. 12, a par-3 over a creek. You’ve seen it; Spieth flared his tee ball high to the right, and it hit the bank and shot back into the water. Stunned, Spieth then took little time with his penalty drop and — distracted and who can blame him? — he absolutely duffed his next shot back into the creek. Another drop, and a fifth shot over the green into a bunker. Up and down for a 7. Despite two birdies from there, it was game and quest for a second green jacket over. That was the injury. The insult came next when Spieth had to proceed directly from the course to Butler Cabin, per Masters tradition, to slip a new green jacket across the shoulders of Danny Willett. Somehow, he sat there and listened to Willett’s winning interview with grace. He looked like a hostage, as a friend quipped to me today, but he sat and listened and congratulated Willett and then answered media questions about his unlikely, practically unbelievable, collapse so near the mountaintop. Here is a link to that interview. Peruse it and decide if you could comport with such class at 22, with your world freshly crashed all around you on global television. It is among the reasons Jordan Spieth is s0 liked, respected and admired by golfers and golf fans. This will pass, and he will return, and he will be back on the biggest stages poised to win again. But like U.Va.’s basketball team, scarred at the heart, Spieth’s ache will beat and pulse and inspire him, from here to whatever comes next, to whatever will be.